I could swear I last updated the Phuket weather blog just a few days ago, but actually the last update was a week ago. And really the weather has stayed just about the same. Hot, sunny, some evening dark clouds and thunder on some days. Just about nothing of note to write about! Of course I am thinking from my perspective. These hot days are normal for me. If you just arrived a couple of days ago from England or Sweden or Russia... the heat is going to hit you. If the temperature is 34 degrees C and it's humid, you're going to feel the heat. You have to drink plenty of water, get plenty of rest and you gotta love the aircon! I certainly like my aircon... in the office at Sunrise Divers, it's nice and cool, and I find there are 2 types of tourists ... some enter the office with a big sigh of pleasure "Ooh! That's Nice!" - some enter and complain that it's cold. Had a German lady last year who opened the door and refused to enter until we turned off the aircon, fearful that she'd get sick. I hope she never walked into a 7-11. Some people don't get aircon. I like the heat, I like the sun, but I want to work in my office without sweating. Before coming here to Thailand, I lived in Utila, a small island off the coast of Honduras. At the time, there was no electricity from midnight to 6am. I lived in a house for a while in the jungle. If you went to bed after midnight - no fan. Best you could do was take a cold shower right before bed and leave the window open hoping for the faintest of breezes. I like aircon, OK?! Suddenly it's almost the weekend again. Been busy in the dive shop, and when I'm busy, the days just blur together. Tomorrow is Friday already, meaning I have a day off coming up soon (Saturday). The last day off seems like just a couple of days ago, we decided on a drive up to the Big Buddha. Not been up there for ages. Weather was great. Skies were mostly blue. We've been driving up the hill to the Buddha since work started. Watched the statue taking shape, being covered in marble - and yes, we've written our names on marble squares that I guess are now somewhere on Buddha. The building continues although the main image is just about complete. And the views are always good. 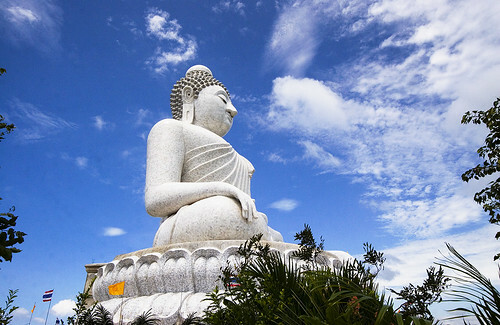 (above) View from the Big Buddha looking south. 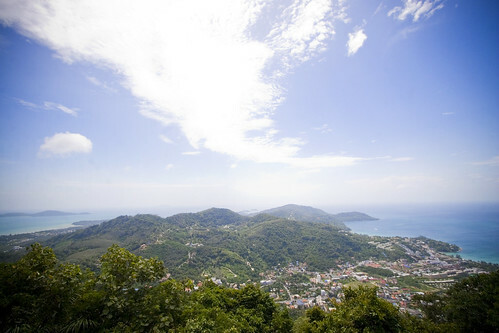 Phuket is a hilly place, and there are lots of great views around the island. So, it's December already. A few days until the King's Birthday (December 5th) which is a public holiday here. Our kids will be off school, but of course I have to work. Happy 84th Birthday to His Majesty!